MDC’s ongoing congress nomination process has produced some surprises in the individuals chosen for the main elective congress scheduled for next month. The youth assembly race is being led by Obey Sithole, who has received two nominations so far from both Matabeleland South and North ahead of the current secretary-general Lovemore Chinoputsa and fiery activist Haruziviishe Makomborero. Chinoputsa has one nomination so far from the United States branch. For the main wing, although MDC leader Nelson Chamisa has since received three nominations so far, there has not been the same consistency for his lieutenants. 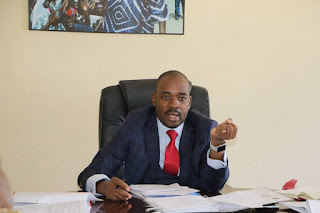 Chamisa is expected to be challenged by secretary-general Douglas Mwonzora, who has, however not yet received any nomination for the presidency. Mwonzora’s backers are adamant that tables will be turned in the course of the nomination. For the youth assembly, Sithole said although the race was still on, taking the early lead is a clear message from young people that they want a refreshed assembly which will take a lead in fighting for their welfare. “We are confronted with a very difficult situation which has the potential to destroy the future of this nation,” he said. “Given that situation, the priority is to recruit and mobilise young people to take part in the political processes. We need to create a more responsible citizenry ready to exercise their constitutional rights in fighting against this military State. “We will develop cadres who are ready to accept the streets as their second homes in pursuit of democratic change. We are confronted with a misinformed uniformed force, which as aiding the continued stay of Zanu PF in power. Clifford Malingwa was nominated for vice-chair, while Ostallos Siziba received nominations for the secretary-general’s position in both Matabeleland South and North provinces. Chamisa got his third nomination while Tendai Biti, Welshman Ncube and Morgen Komichi who are eyeing the vice-presidency received a boost in Matabeleland North province.